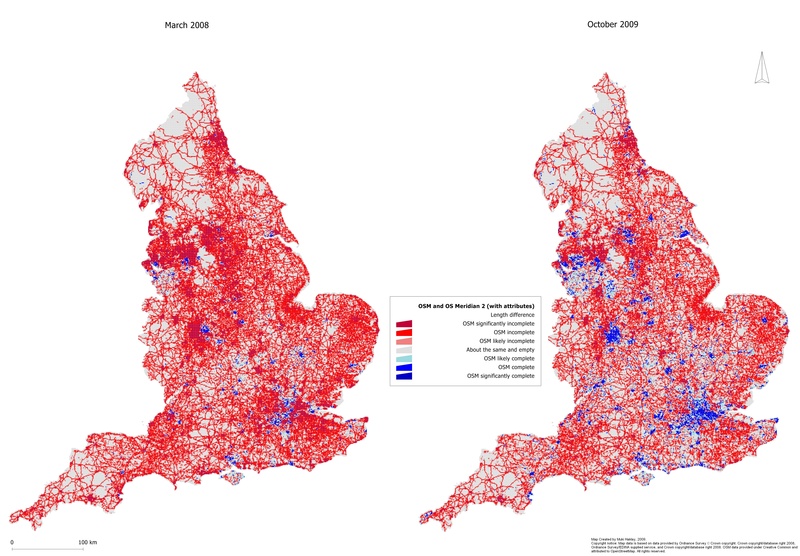 As part of an update of the work that I published in August 2008, I re-ran the comparison between the OpenStreetMap and Ordnance Survey Meridian 2 datasets. In a future post, I will provide a full report of this assessment. As I have now completed the evaluation for October 2009 and a re-evaluation of the data from March 2008, I decided to publish some outputs. 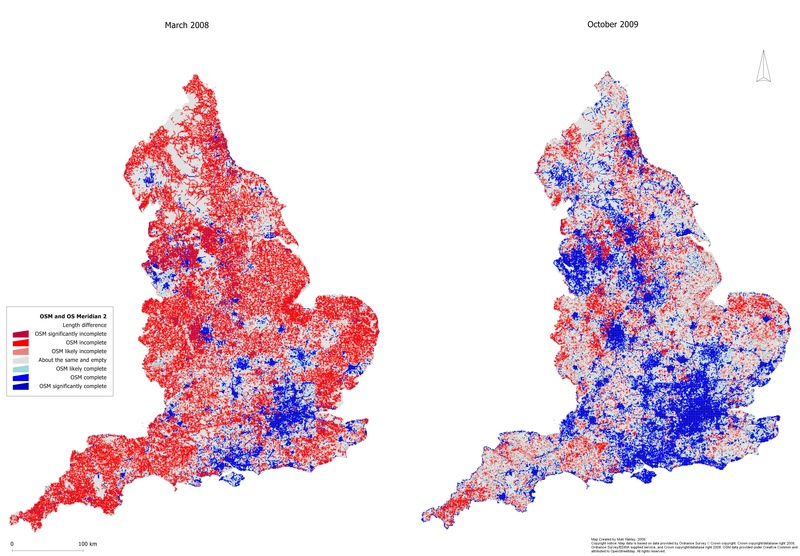 The map below shows the completeness of OpenStreetMap across England for the two periods. Click on the map to enlarge. The second set of maps show the estimation of completeness when attributes are considered. For this purpose, the calculation takes into account only line objects that are comparable to those in Meridian 2; thus not including features such as footpaths. The following types of roads were used: motorway, motorway_link, primary, primary_link, secondary, secondary_link, trunk, trunk_link, tertiary, tertiary_link, minor, unclassified and residential. In addition, a test verified that the ‘name’ field is not empty. This is an indication that a street name or road number is included in the attributes of the objects, and thus it can be considered to be complete with basic attributes. In order to make the comparison appropriate, only objects that contain a road name or number in Meridian 2 were included. The growth within just over a year and a half is very impressive – rising from 27% in March 2008 to 65% in October 2009. When attributes are considered, it has risen from 7% to 25%. Notice that the criteria that I have set for this comparison are stringent than the one in the previous study, so the numbers – especially for the attribute completeness – are lower than those published in August 2008.